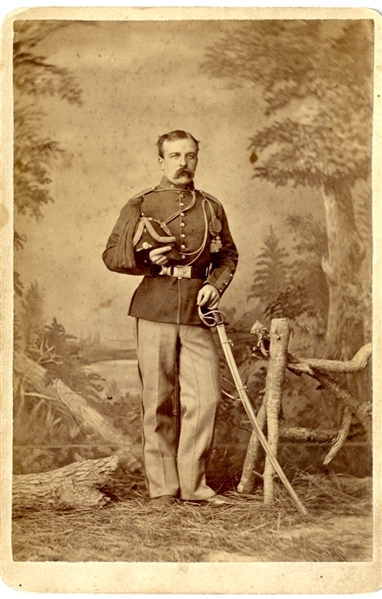 Cabinet card photograph of a 7th Cavalry soldier c. Little Big Horn era, 1876. No backmark. Fine condition. The 7th Cavalry Regiment is a United States Army cavalry regiment formed in 1866. Its official nickname is "Garryowen", after the Irish air "Garryowen" that was adopted as its march tune. Following its activation, the Seventh Cavalry Regiment patrolled the Western plains for raiding Native Americans and to protect the westward movement of pioneers. From 1866 to 1881, the regiment marched a total of 181,692 miles across Kansas, Montana, and Dakota Territory.